One last PB for the year? Did I mention I’ve PB’ed at every distance this year …. apart from 10K? Might have mentioned it, because I’m incredibly proud of this achievement. I really wanted to manage to PB at EVERY distance this year, no exceptions, but this was going to be difficult as my 10K PB was set last year in perfect conditions. 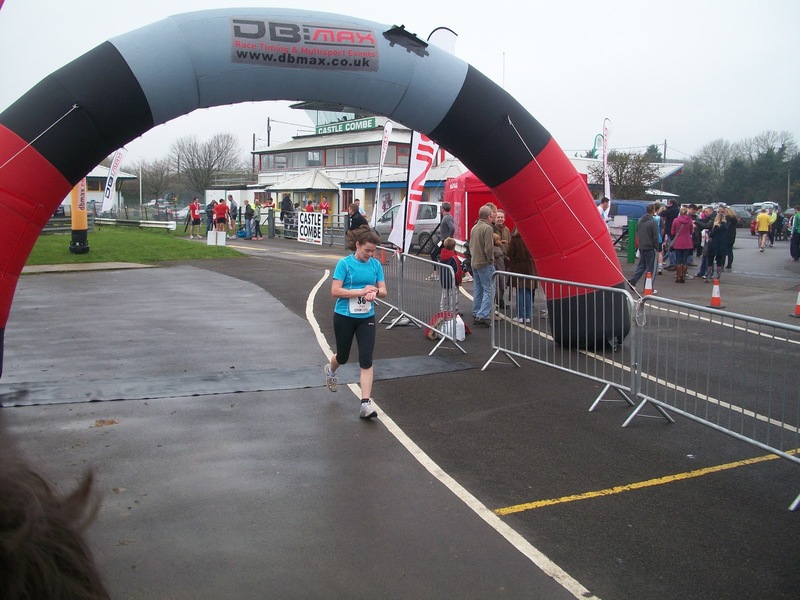 The race was the ‘Castle Combe Chilly 10K’ which is run around a racing circuit and so is pancake flat. If its windy the course can be windswept and desolate, but the weather behaved itself and was calm but cool. No traffic, wide flat ‘road’ so no weaving around other runners, and plenty of people running at about the same pace as me so lots of people to chase down. Oh, and my children were able to stick bags of chips through the gaps in the Pit Lane wall whilst shouting encouragement like “Hurry up or we’ll eat yours!” A surefire way to make a Northern lass speed up! This year’s Castle Combe Chilly 10k was set for Sunday November 25th 2012, so I’ve had my eye on this date for weeks, trying my best to run my intervals and do my tempo runs. I had even reached the point of working out what pace I should aim for. And then …. disaster struck, in the form of a snotty son needing cuddles. By Friday I was full of cold and feeling dreadful. By Saturday night I had abandoned plans to run unless a miracle happened overnight, and by Sunday morning I acknowledged a miracle hadn’t happened, and went back to bed. So no PB, not even an attempt at a PB, just a pile of germ-y tissues and a feeling of disappointment. Ah well – next race is the Dorothy House ‘Santa Dash’ in aid of our local hospice. I’ve never done a Santa Run* before, and its a 6K run which I never done before, so I guess that’ll be a new PB then, won’t it! *I did overtake Santa in the Chippenham Half Marathon a few years ago – the jingle bells on his trousers were driving me mad!